Ankylosing spondylitis is a form of arthritis that mainly targets the spine. 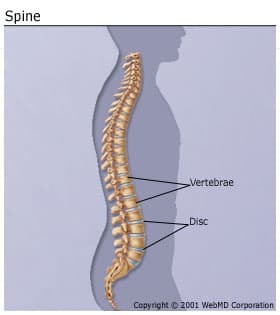 Over time, ankylosing spondylitis can cause your spine to become stiffer, and eventually the vertebrae (bones in your spine) may fuse together. People have a tendency to develop a stooped posture as the disease progresses. It is one of a group of diseases called spondyloarthropathies that affects about 2 to 5 people out of 1,000. Other joints areas that can be affected include shoulders, hips, and often tendons connected to bones, such as the heel. Severe disease may lead to stooped posture and deformities. Inflammation of the eyes, called uveitis, is common, and less frequently, scarring of the lungs, inflammation of the prostate, and inflammation of the aorta and aortic valve. While it was once thought that ankylosing spondylitis was mainly a male disease, it is now known that women get the disease too, with a ratio of 2 to 3 men for every woman. The disease in woman tends to be more atypical and affects the neck and limb joints more often. Most symptoms of ankylosing spondylitis start in early adulthood, before age 40, although young men may have symptoms in early adolescence or, occasionally, in childhood. The cause of ankylosing spondylitis is unknown, although research shows that people with this disorder are more likely to have a certain genetic marker called HLA-B27. If there is a close family history of ankylosing spondylitis (parents or siblings have it), and a person is also positive for the HLA-B27 marker, there is about a 20% chance that individual will develop ankylosing spondylitis. Reveille, J.Am J Med Sci., 2011 Apr; 341(4): 284–286. Brown, M. Arthritis & Rheumatism, Dec. 2005.